Up for review today is the Romeo San Andrés by Romeo y Julieta, in the toro size. As of this writing, it is the newest addition to the Romeo y Julieta line of cigars. 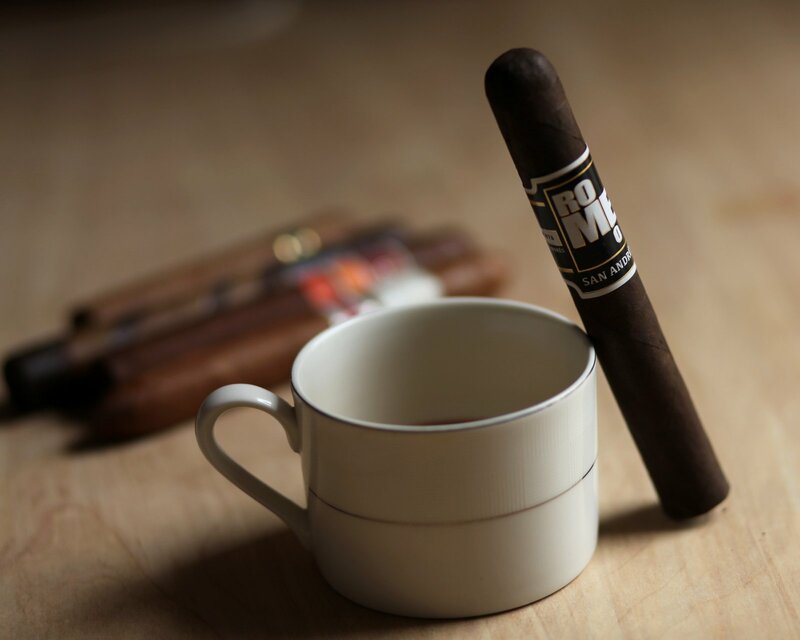 The cigar is unique for two main reasons. First, it comes wrapped in a Mexican San Andrés wrapper, all but guaranteeing that the cigar will be anything but a typical RyJ. Second, the cigar is the product of a partnership between AJ Fernandez and Rafael Nodal of Altadis USA. If you aren’t familiar with the happenings of the cigar world in the last few years, I can catch you up to speed just by saying that Fernandez and Nodal are two of the most sought after, experienced, and dynamic blenders in the game today. That being said, I’ve never been a huge fan of Romeo y Julieta cigars, so I’m excited in this review to find out if Nodal and Fernandez create something that transcends my experiences with the brand in the past. The Romeo San Andrés sports a dark-chocolate brown wrapper that is nearly flawless. The wrapper has a light layer of oil, making the wrapper a touch reflective when held up to the light. I’m struck most of all though by just how beautiful the leaf itself is. It’s very smooth with just a touch of texture, and takes real inspection to discover the small veins covering the leaf. The label itself is nothing to write home about. White, gold and black, with ROMEO taking up the majority of the cigar. Not the most attractive band, but the black and white certainly complement the darkness of the wrapper. The cold draw has just the right amount of restrictiveness, and delivers some initial notes of earth, generic spice, and cedar. Lighting the cigar, the Romeo San Andrés opens with an enjoyable, albeit straightforward, array of flavors. The smoke is quite strong, with flavors of earth, barnyard, cherry, and some pepper and dark chocolate. I can’t say why but it feels like a flavor profile I’ve had many times over. Flavor strength and body are both in the medium plus territory, and on the retrohale I get an almost overwhelming amount of white pepper. At an inch in, the burn is razor sharp and perfectly straight. The ash is almost completely white, and complements the white of the band nicely. I’ve also noticed that the flavor profile is changing quickly, with the strength drawing down toward medium and the pepper notes subsiding. In addition to the core notes, a nice buttered popcorn note emerges which complements the darker notes nicely. Heading in to the second third, the cigar has leveled out at medium bodied / medium strength. The texture of the smoke has lost most of its pepper and is now more akin to molasses. Dominant notes include milk chocolate, wood, touches of spice, and a creamy finish. At this point there’s lots of flavor and a decent amount of complexity, making for an enjoyable smoke. The next half an hour or so is more of the same. Still enjoyable, but would love to have seen more movement in this period. As the cigar burns well into the final third, the strength and body shoot back up, with pepper in the foreground interacting mainly on the tip of the tongue. Flavor wise, not much has changed. Nearing the final inch, the heat of the smoke picks up a lot and I put the cigar down. Overall, the Romeo San Andrés does a solid job of capturing the San Andrés flavor profile, but with some additional creaminess I enjoyed. And I think that Nodal and Fernandez have made a good contribution to the RyJ portfolio. Still, a stellar rating is a bit out of reach for this blend because for much of the cigar, the complexity stalls and flatlines. Additionally, I don’t think this cigar offers anything fundamentally new to the greater cigar world. There are certainly other cigars out there with very similar profiles. That said, if you’re a fan of San Andrés wrappers, this is a worthwhile cigar to try, and it may just make its way into your regular lineup.